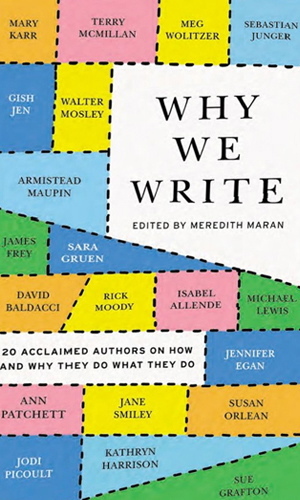 I just finished reading a fun book called Why We Write, in which editor Meredith Maran compiles thoughts from well-known writers such as Mary Karr, Meg Wolitzer, and Sebastian Junger. In it, we learn that lots of people aren’t sure exactly why they write, but that doesn’t stop them from having interesting insights about the process. (We also learn, if we didn’t know already, that most writers hate the act of writing, or at least parts of it, sometimes.) Mostly, we get some solid advice from some of our nation’s most commercially and critically successful writers, both fiction and non.